KATHMANDU, Sept 27: CPN-UML Chairman KP Sharma Oli, who is also the leader of the main opposition, has accused Prime Minister Pushpa Kamal Dahal of inviting Indian intervention in Nepal's constitution amendment issues and signing some of the objectionable points during his visit to India earlier this month. He was referring to the 25-point joint communique issued at the end of the visit. Former Prime Minister Oli said Dahal had unnecessarily invited Indian intervention into Nepal's constitutional business as if it is an issue of mutual interest. "This is not only unnecessary but also an objectionable act. I therefore on behalf of my party, CPN-UML, express objection here in this House meeting," Oli said while addressing parliament meeting on Tuesday. "This government is not holding any discussion on the matter among the political parties here in the country while it has invited foreign intervention." He claimed that there are so many other clauses included in the communiqué that have undermined Nepal's national interest. Oli said the wordings used in point number 11 of the joint statement have undermined Nepal's right to take independent decision with regard to international issues. "The point has constrained its right to take decisions independently as a sovereign nation. This is very inappropriate," he said. 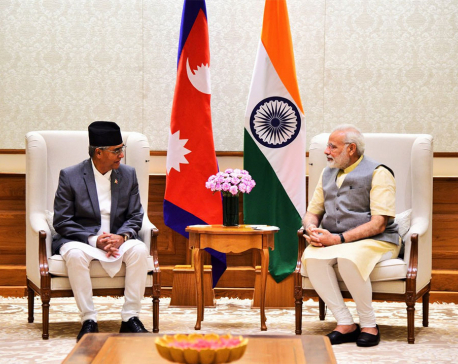 According to him, point number 12 has infringed into the jurisdiction of the Eminent Persons' Group, which is mandated to study the whole gamut of Nepal-India relations and recommend solutions to the two governments in updating relations between the two sides. He termed point number 13 as inappropriate and objectionable as that has said both sides agreed to set up an oversight mechanism comprising senior officials from the Indian Embassy in Kathmandu and the government of Nepal to review progress together with respective project implementing agencies or developers of ongoing economic and development projects on a regular basis, and take necessary steps to expedite their implementation. "There should have been mention of the government of India, not the Indian Embassy. This is very objectionable," he said. 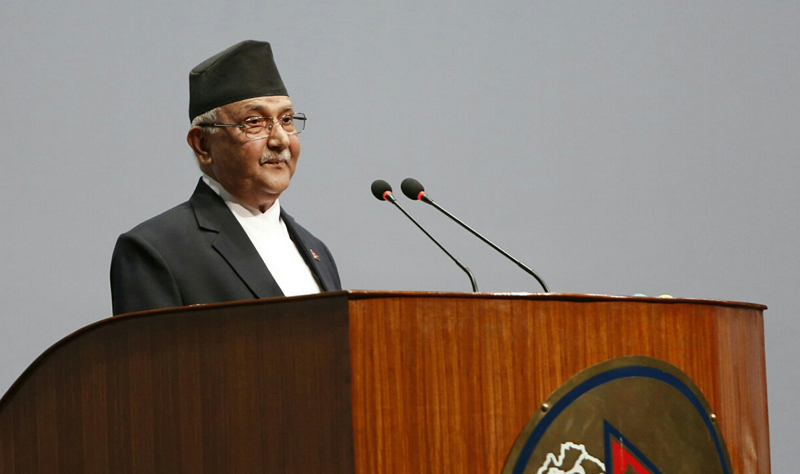 In his hour-long address in parliament, Oli described several points of the 25-point communiqué to prove Dahal had undermined Nepal's national interest during his recent India visit. He also accused the present government of trying to undo the progress made with regard to implementing trade and transit treaty and other deals reached with China. Oli asked Dahal, who was present in parliament, as to what were those achievements made during the prime minister's visit that made "him so proud of the visit." 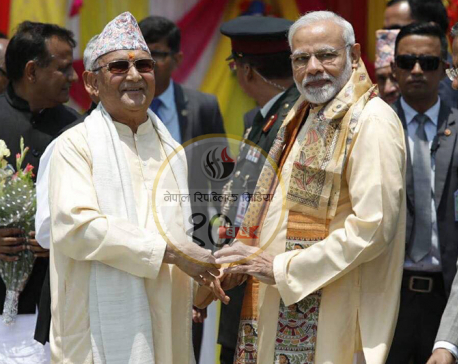 "The prime minister has been repeatedly claiming that his visit was very successful in improving Nepal-India relations. What are the grounds for the claim? Are the aforementioned clauses these achievements? If so, the prime minister should let us know if there are some other achievements as well," he said. "Is there any agreement or deal that the previous government could not get itself to sign?" He expressed strong objection for criticizing the opposition party in a foreign country during the same meeting. He also criticized the prime minister for meeting a man absconding after being accused in the last year's Kailali massacre in which nine policemen and a two-year-old were killed. 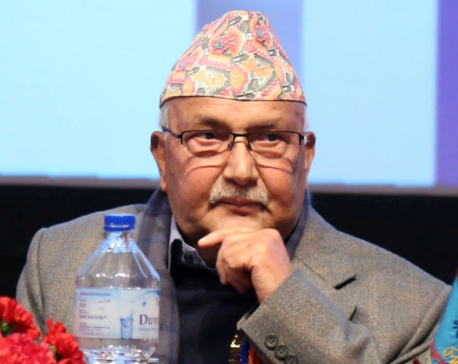 On the ongoing debate on fixing the number and boundaries of local units in the federal system, Oli said his party was flexible on the number but that it should be done without undermining the role of the commission formed to fix the number and boundaries of the units.